A recent visit to a friend’s blog was very inspiring. She’s discovered her greatness in a very multifaceted way and I love how she’s sharing it with the world. I hope you’ll take the time to read and visit her often as well. That being said….What message do we send? 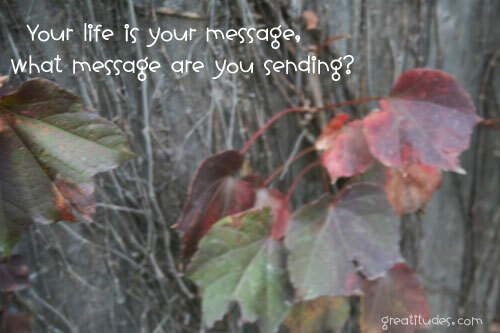 What message are we living? What message would you like to project? Do you like what you see? Are there things you feel you need to tweak a little more to reach that goal you are seeking? How can you achieve it? There are many who look and look yet never go anywhere – because they choose to look for what they’re seeking in others and never look at themselves. What they are seeking can always be found in their heart. It’s in their very core. It’s always been there — it needs to be awakened. It can be. It was once. Find it again. Enjoy being you! Find your Greatness and be YOU!